Tamar (תָּמָר, Hebrew meaning "Date Palm") was the fore-mother of the Jews and the daughter-in-law of the patriarch Judah, the son of Jacob. She was the ancestor of King David in the Hebrew Bible and of Jesus Christ in the New Testament. Though ignored in most Christian sources, Tamar played an important role in the lineage of Jesus. Her story involves life-risking drama and sexual intrigue, in which she is ultimately vindicated, despite the morally dubious tactics she used to achieve her goal of producing sons for Judah's lineage. She was originally married to Judah's eldest son, Er (Gen. 38:6). After Er's death, she was married to Onan, his brother, who also died. Judah promised that his third son, Shelah, would become her husband. When this promise was not fulfilled, Tamar disguised herself as a temple prostitute in the town of Timnah and offered herself to her father-in-law Judah. She claimed his staff, cord, and signet ring as a pledge in token of payment but did not appear later to receive her pay. From this union, Tamar became pregnant. When Judah accused her of fornication, she produced his possessions and identified Judah himself as the father. Tamar had twin sons, Zerah and Perez (Gen. 38:30), thus securing Judah's lineage. Among her descendants were King David, each of the subsequent kings of Judah, and—in the New Testament—Jesus Christ. Tamar is one of only five women mentioned in Matthew's version of the genealogy of Jesus, the others being Ruth, Rahab, Bathsheba, and Mary. Little is said in the Bible of Tamar's life other than what is written in the Genesis 38. Her story appears as an interlude in the much longer saga of the patriarch Joseph, who had been sold into slavery in Egypt by his brothers. Judah and the other sons of Jacob remain in Canaan with their father, and Judah arranges a marriage between his eldest son, Er, and Tamar. Nothing is said of Er other than that "he was wicked in the Lord's sight; so the Lord put him to death" (Gen. 38:7). Anticipating the later "levirate" law by which an Israelite who dies without a son will be given children posthumously through his brothers (Deut. 25: 5-10), Judah commands his second son, Onan: "Lie with your brother's wife and fulfill your duty to her as a brother-in-law to produce offspring for your brother." Onan complies with the first half of the command and becomes Tamar's husband, but he refuses to father children through her on Er's behalf, opting instead to "spill his seed on the ground." Onan, too, soon dies, and Judah promptly promises to provide his third son, Shelah, as a husband for Tamar when he comes of age. However, fearing that Tamar is bad luck and that Shelah too will die if he becomes her husband, Judah does not fulfill his word to her. Years later, with Judah's own wife now dead and Tamar's biological clock reaching a critical point, and Judah showing no sign of providing a husband for her, Tamar decides on desperate measures. 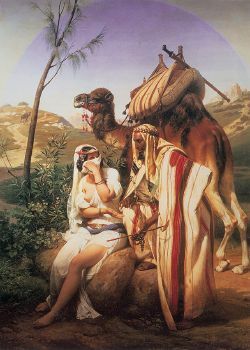 Hearing that Judah will attend the spring sheep-sheering festival at the nearby town of Timnah, she disguises herself as a sacred prostitute (probably honoring the goddess Ishtar/Astarte during a spring fertility festival) and, waiting at the town gate, lures Judah into a sexual relationship. Not knowing her true identity, he provides his staff, signet ring, and cord to her until such time as he can return with a young goat as payment for her services. She returns home with his possessions, having become pregnant, and does not turn up when Judah's servant inquires for the "shrine prostitute" at Timnah's town gate in order to pay her and redeem Judah's things. Three months later, when Judah learns of Tamar's pregnancy, he naturally suspects her of adultery. Hypocritically outraged at her crime, he commands that she be brought out to be burned alive as punishment. She defends herself dramatically by producing Judah's items, saying, "I am pregnant by the man who owns these. See if you recognize whose seal and cord and staff these are." Judah, admitting his sin, replies: "She is more righteous than I, since I wouldn't give her to my son Shelah." Tamar then has twin sons, called Perez (also spelled Phares) and Zerah. Like her forerunner Rebecca, the mother of Jacob and Esau, Tamar suffers immensely during her pregnancy, as her sons wrestle with each other for supremacy in her womb. Zerah's hand emerges first, and a midwife ties a red thread around his wrist. Miraculously, however, his hand is withdrawn, and the apparent second son, Perez, is born first. The lineage of Perez and Zerah, as well as three other sons of Judah, is detailed in the First Book of Chronicles, chapter 2. Thus Tamar becomes the fore-mother of the tribe of Judah, which in turn became the dominant tribe of the southern Kingdom of Judah and later provided both the population and religious tradition of the people known to history as the Jews. Tamar's story has been the cause of considerable discomfort for pious biblical commentators until fairly recently, due to controversial moral issues related to her. Christian sources tended to ignore her almost entirely (there is no entry for her in the Catholic Encyclopedia, for example). However, Talmudic authorities had a good deal to say about Tamar and her relationship with Judah. The following are among the rabbinic opinions: Tamar was the granddaughter of Noah through his son Shem (Gen. Rabbah 30:11), Noah having lived until well into the time of Abraham. In the house of Judah, she was extremely virtuous and timid, keeping her face covered with a veil. This is the reason that Judah failed to recognize her at Timnah (Sotah 10b). Tamar resolved on her desperate course of deceiving Judah only after praying to God that she might not go barren from Judah's house. In reply to Judah's questions at the Timnah gate, she declared that she was not a Gentile and that she was unmarried (Sotah 10a). When she had become pregnant she was not at all ashamed of her condition, but boasted to all that she would be the mother of kings and redeemers (Gen. Rabbah 85:11). Despite the apparent claim in Genesis to the contrary, after her innocence had been proved, Judah continued to live with her in marital relations (Sotah 10b). Rashi and others hold that the word "harlot" did not mean that Tamar was actually posing as a sacred harlot of Ishtar/Astarte at Timnah, but rather that she was "prepared for harlotry," meaning fornication. However, most modern commentators see her as disguising herself as a priestess of this Canaanite goddess, who is portrayed in ancient literature as being attended by women who honored her by sharing their sexual favors with local men in a ritual thought to bring the blessings of heaven and ensure the fertility of the crops. It is noteworthy that the commandment, "You shall have no other gods before me," would not be given to the Israelites until several generations after this, reportedly during the time of Moses. 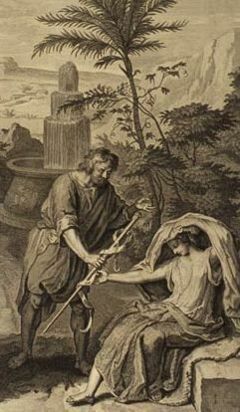 Modern commentators nearly unanimously agree that Tamar's tale serves as an origin story explaining the custom of levirate marriage. The importance of levirate marriage is reaffirmed in the story of Ruth. Thus, both the tribe of Judah and King David (twice) are portrayed as having their origins in such an arrangement. Several modern commentators speak of Tamar as a figure of significance in the history of women's rights. Alan Dershowitz, in The Genesis of Justice: Ten stories of Biblical Injustice that Led to the Ten Commandments and Modern Law, sees Tamar as an example of the ancient patriarchal tradition in which the sole purpose of a woman’s existence is motherhood. Although she is bound to accept this role, Tamar is willing to challenge male supremacy by taking matters into her own hands when Judah refuses to give her a husband. "Tamar responds like a hard-headed business woman," write David M. Gunn and Danna Nolan Fewell, "finally exacting the rather serious pledge of Judah’s seal and cord." Johnathan Kirsch honors Tamar as "the woman who willed herself into history" and uses her tale as the cover story of his book, The Harlot by the Side of Road: Forbidden Tales of the Bible. Novelist Francis Rivers makes Tamar the heroine in the first installment of her "Lineage of Grace" book series, under the title Unveiled: Tamar. Tamar is a prophetess, and she usurps the future beyond any prophet's achievement. She is single-minded, fearless, and totally self-confident, and she has absolute insight into Judah. Most crucially, she knows that she is the future, and she sets aside societal and male-imposed conventions in order to arrive at her truth, which will turn out to be Yahweh's truth, or David. Her sons are born without stigma, and she too is beyond stigma... Her struggle is the woman's analogue to Jacob's grand defiance of death at Esau's hands in an all-night contest with death's angel. Of the two agonists, Tamar is the more heroic and battles even greater odds. God selected His champions from the most miserable situations. Tamar was a righteous woman, and though she was placed in a sinful position, she completely dedicated herself to God's mission, risking her life, honor, and prestige... Through this victory at the time of Tamar, and also Jacob's earlier victory, God could claim a foundation that spanned the entire human life-span. Jesus was born in the lineage of Judah, and Satan had no way to invade his life [because of Tamar's victory]. and Jesse the father of King David. and Josiah the father of Jeconiah [Jehoiachin] and his brothers at the time of the exile to Babylon. A daughter of David (2 Sam. 13:1-32; 1 Chron. 3:9), and thus a descendant of the original Tamar. Her half-brother Amnon raped her and afterwards hated her exceedingly, provoking the enmity of David's favorite son, Absalom. A daughter of Absalom (2 Sam. 14:27), niece of Tamar the daughter of David, and a descendant of the original Tamar. Mother of Maachah, who became King Rehoboam's wife. At least two places mentioned in the Bible include the name "Tamar"—Hazazon Tamar (Gen. 14:7), which is identified with Ein Gedi (on the western shore of the Dead Sea) in 2 Chronicles 20:2. This is likely the same place called simply "Tamar" by the prophet Ezekiel (47:19; 48:28). A separate place, "Baal Tamar," was reportedly located west of Gibeah in Israel's central highlands (Judg. 20:33). ↑ Isidore Singer, “Tamar,” Jewish Encyclopedia. Retrieved August 16, 2007. ↑ David M. Gunn and Danna Nolan Fewell, Narrative in the Hebrew Bible (New York: Oxford University Press, 1993, ISBN 0192132458), 39. ↑ Sun Myung Moon, “God's Warning to the World: Reverend Moon's Message from Prison.” Retrieved August 16, 2007. ↑ While this list faithfully follows Old Testament sources up though the time of the Babylonian exile, it is unconfirmed thereafter. Indeed, it constitutes the only known list detailing the supposed Davidic line during the period of "Second Temple." This entry incorporates text from the public domain "Easton's Bible Dictionary," originally published in 1897. All links retrieved November 12, 2015. This page was last modified on 12 November 2015, at 17:27.